MADISON, Wis. — An energy consulting firm predicts several new EPA regulations will go through bank accounts like a tsunami, and the storm will come from three directions. Environmental Protection Agency policies that aim to cut carbon dioxide emissions are expected to create $284 billion in additional energy costs in 2020, according to a report by Energy Ventures Analysis Inc. The policies, which President Obama supports, will result in a $680 increase in annual electricity and natural gas bills, says the study, commissioned by Peabody Energy, the world’s largest private-sector coal company. The American industrial industry will be hardest hit, with some $200 billion in new energy expenses. Some of that, of course, will be passed along to the consumer, putting an even further strain on personal finances. But don’t forget about paying for an influx of families that will now qualify for help from publicly funded energy assistance programs. In Wisconsin, the number of families seeking help from the state’s Home Energy Assistance Program has increased steadily, although the average distribution amounts are having a hard time keeping up. The program, which operates with state and federal money, gave $122,679,158 to 178,337 households in 2009, with close to 209,000 applying. Each family got an average of $687.91. The Wisconsin Department of Administration, which oversees the program, estimates it will help 227,000 families pay their heating bills in 2014-15, according to agency spokeswoman Stephanie Marquis. Since Oct. 1, the state has helped 39,347 households. The program should see even more activity in 2020, especially with Wisconsin’s energy costs expected to increase by $4.8 billion, with the average family paying $488 more in annual bills. That 28 percent hike represents the 34th largest in the country. “Consumers and policymakers must understand the full consequences of EPA’s existing and proposed policies and the real energy crisis that the agency is about to create,” Svec said. The Energy Ventures Analysis report blames a majority of the cost increases on several EPA regulations in recent years, including the National Ambient Air Quality Standards, Cross-State Air Pollution Rule and Mercury and Air Toxics Standards. A 135 percent hike in the wholesale price of natural gas is also affecting electricity and natural gas rates. Blame that increase on baseline market and policy changes between 2012 and 2020, as well as a higher pressure on gas prices caused by recent EPA regulations on the power sector and the proposed Clean Power Plan, the study says. Testifying before the EPA this summer, Peabody called for a withdrawal of the planned carbon rule for existing power plants and instead recommended a greater expansion of technology as the long-term solution to improving emissions, according to Svec. Peabody has proposed investing in efficiency improvements, deploying advanced super-critical coal plants and supporting greater research and development toward next-generation technologies, including carbon capture and storage, Svec said. Public hearings start Monday on a proposed highway between Apache Junction and Eloy. The “North-South Corridor” would link U.S. 60 to I-10 through the San Tan Valley. The Arizona Department of Transportation and the Federal Highway Administration are hosting four public hearings in Pinal County this month. They’ll unveil a recently completed list of alternative routes for the proposed 45-mile transportation corridor. It’s part of the environmental impact statement portion of the project. Members of the public are invited to comment on the plan. Monday’s meeting will be held at Walker Butte Elementary School in Queen Creek. There’s another hearing Tuesday night at Santa Cruz High School in Eloy. There will be a meeting at Apache Junction High School Wednesday evening and another Thursday night at the Coolidge-Florence Elks Lodge in Coolidge. A state board has blocked construction of a controversial copper mine planned for central Arizona, at least the way it is planned. Curis Resources wants to pump an acid solution into the ground beneath Florence to dissolve the copper compounds. It would then pump the mixture back to the surface, strip out the copper, and reuse the acid. But, the Arizona Water Quality Appeals Board has found flaws in the permit Curis was given to start the operation by the Department of Environmental Quality. An administrative law judge says the permit allows pollutants from the mine to spread too far, but Rita Maguire, of Curis says that hurdle could be overcome. “The judge felt as though that there wasn’t enough documentation to support how the pollution management area had been drafted and approved by DEQ. So we’ll go back to DEQ and submit additional information,” Maguire said. But attorney Larry Crown who represents mine opponents says it’s not that simple. “There were fundamental flaws and errors in the application and in the permit terms as issued. And so, time will tell. This permit, as issued, has been rejected. And it’s not a simple matter to just go back and say there’s some minor things to fix,” Crown said. He says the plan needs a major overhaul. But any changes made by the company and DEQ would be subject to another round of public hearings and appeals. While expressing disappointment about voters failing to pass a proposed 15 percent school budget override, the Apache Junction Unified School District superintendent also said the district will take a few weeks before making decisions over which budget cuts to make. “It’s with disappointment and frustration that I report to you the November override initiative was unsuccessful,” AJUSD Superintendent Chad Wilson said in a video posted on the district’s website, http://www.ajusd.org. The district’s first override passed in 1999 and was renewed in 2003. Further votes failed in May 2007 and November 2007, 2009 and 2010. In the Nov. 4 general election, voters turned down the proposed 15 percent maintenance and operations budget override that would have raised approximately $3.2 million each year. According to the unofficial final results (19 of 19 precincts reporting) updated Nov. 10, the override received 6,065 “yes” votes and 7,946 “no” votes. The override would have allowed the district to prevent large class sizes, improve school safety and offer competitive salaries to teachers, Mr. Wilson said in a Sept. 18 phone interview. The district governing board voted in June to put the override on the ballot, Mr. Wilson said. The governing board will vote in July to approve its budget for 2015-16. At its regular meeting July 15, 2014, the governing board approved a $23.8 million budget for the 2014-15 fiscal year, according to a press release. It included a decrease of approximately $156,000 primarily due to a decrease in enrollment and a loss of $337,000 due to a drop in targeted government funding, according to the release. In both the video and e-mailed statement, Mr. Wilson thanked the volunteers who spent their time and money to support the override initiative. The video may be viewed on the school’s website and on YouTube. In other school election news, incumbent Mike Weaver retained his seat on the AJUSD Governing Board. Unofficial final results (19 of 19 precincts reporting) show Mr. Weaver receiving 6,087 votes. He will be joined by newcomer Dena Kimble, who received 5,605 votes, according to unofficial final results. She will replace Lucy Young, whose term expires Dec. 14. Candidate Cami Garcia received 4,448 and Kelli Anne Caplette received 3,870, according to unofficial final results. Constable (Pinal County Precinct 7): Unofficial final results (25 of 25 precincts reporting) show John Acton (Republican) winning with 14,308 votes and Victor Rodas (Independent) with 10,300. There were 96 write-in votes. Pinal County Sheriff Paul Babeu had requested Mr. Acton formally withdraw from the race due to allegations of impersonating a police officer and falsifying his service as a Chicago police officer, according to a press release issued by Sheriff Babeu’s office. “I was a police officer in Chicago (for the Chicago Transit Authority), not a member of the Chicago police force,” Mr. Acton told the Independent during an interview Oct. 8. Incumbent Shaun Babeu (Republican) ran unopposed for Justice of the Peace (Pinal County Precinct 7). Unofficial final results show him receiving 19,712 votes. There were 581 write-in votes. In the race for Congressional District 4, which includes Apache Junction, Gold Canyon and San Tan Valley, the unofficial final results (211 of 211 precincts statewide reporting) show incumbent Paul Gosar (Republican) winning with 121,848 votes, followed by Mike Weisser (Democrat) with 45,002 and Chris Rike (Libertarian) with 7,377. There were 164 write-in votes. In the race for Congressional District 5, which includes Apache Junction and Gold Canyon, the unofficial results (113 of 113 precincts reporting) show Matt Salmon (Republican) receiving 124,801 votes with James Woods (Democrat) receiving 54,575. There were 313 write-in votes. In the race for state representative District 16, which includes Apache Junction and Gold Canyon, voters re-elected the two incumbents. The unofficial final results show incumbents Doug Coleman (Republican) and Kelly Townsend (Republican) winning with 28,904 and 28,293 votes, respectively. Cara Prior (Republican) received 11,773 votes, and there were 160 write-in votes, according to the unofficial results. 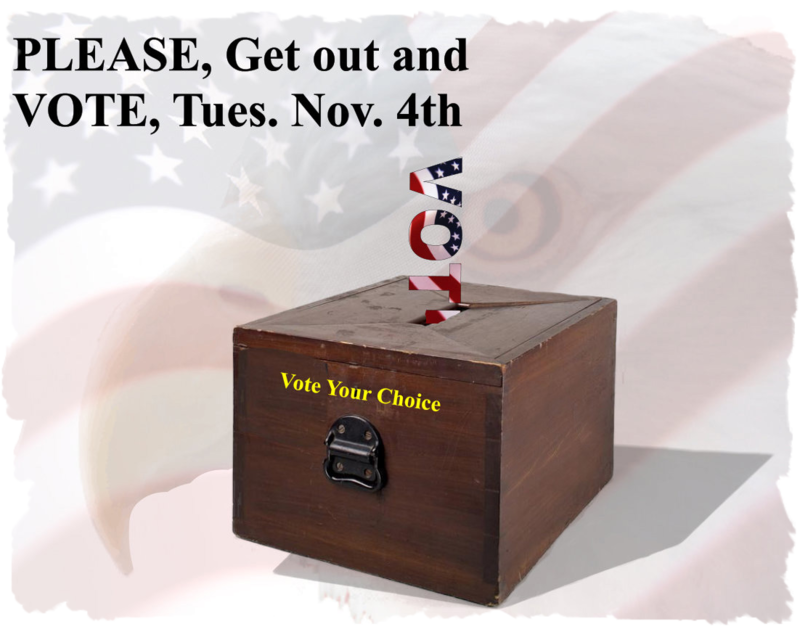 For the latest for Pinal County, go to the Pinal County elections website. For the latest state results, go to the state elections website. Several events have been scheduled in Apache Junction and Gold Canyon to honor the area’s military veterans for Veterans Day. From noon to 1 p.m. on Wednesday, Nov. 5, Central Arizona College will honor all who serve and have served in the military during a ceremony at its Superstition Mountain campus, 805 S. Idaho Road in Apache Junction. Participating in the program will be the Apache Junction High School Color Guard. Julian Easter, CAC’s dean of health careers and sciences, will speak about Veterans Day while Kyle Wiegart will be the student veteran speaker, Angela Askey, CAC’s director of marketing, said in an e-mailed response to questions. The ceremony will take place on the east side of the F Building near the flagpoles. Punch and cookies will be served after the event, Ms. Askey said. For more information, e-mail veterans@centralaz.edu or call 520-494-5402. Starting at 3 p.m. Sunday, Nov. 9, the Ninth Annual Celebration of Veterans will begin at Gold Canyon United Methodist Church, 6640 S. Kings Ranch Road in Gold Canyon. The event is free; however, a free-will offering will be accepted. Military veterans will be recognized through patriotic music, guest speakers with personal wartime stories and poems, according to a press release. The master of ceremonies will be U.S. Army Spc. Earl Beasley. The keynote speaker will be U.S. Army Staff Sgt. Ron Silver Eagle D’Andre II. Musical entertainment will be performed by the Agape Brass Quintet, George Staerkel from Barleens Arizona Opry, The Housers, baritone Don Engbrecht and Gary Sauerbrunn along with GCUMC Music Director Douglas J. Benton and the combined choirs of the three churches. In addition, the Girl Scouts of America will perform a flag-retirement ceremony. All proceeds of the free-will offering will be donated to the Carl T. Hayden Veterans Affairs Medical Center, 650 E. Indian School Road in Phoenix, to assist returning warriors. Attendees are asked to bring at least one non-perishable food item per person for the Gold Canyon UMC Food Bank. Refreshments will be served after the ceremony in the courtyard area. For more information, call Rae Tianen 480-671-7378 or Don Tianen 480-694-7122. The Apache Junction Veterans Day Parade has been held on Veterans Day — Nov. 11 — each year for more than 20 years, according to the parade committee’s Facebook page. This year’s parade will begin at 9:30 a.m. Tuesday, Nov. 11. The start time was changed from 9 a.m. to accommodate the schedule of the Commemorative Air Force to perform a flyover to kick off the procession, committee member Dave Waldron said during a phone interview Oct. 30. This year’s theme is Veterans Helping Veterans, Mr. Waldron said. The parade takes place along West Apache Trail. It begins at North Apache Trail/Phelps Drive and proceeds in the westbound lanes to Gold Drive, where participants will turn left and head back in the eastbound lanes of West Apache Trail to Phelps Drive. The parade can be viewed from both sides of the road, Mr. Waldron said. The parade route will close to traffic at 6 a.m.
Just prior to the start of the parade, at 9:15 a.m., the entries carrying American flags will gather at the Focal Point on the northwest corner of North Apache Trail/Phelps Drive and West Apache Trail for the Massing of the Colors ceremony of remembrance. A flyover by the Commemorative Air Force at 9:30 a.m. will signal the start of the parade. At 11 a.m., a ceremony honoring Veterans Day will be hosted by American Legion Post 27, 1018 S. Meridian Road in Apache Junction. It is open to the public. A moment of silence will take place at 11:11 a.m., the moment the guns fell silent ending World War I. More than 40 participants from the east Valley are expected to take part this year in the hour-long procession, Mr. Waldron said by phone Oct. 28. – Larry Taylor, U.S. Army: Mr. Taylor joined the Army in 1970. He received mortar training and was eventually assigned to Stuttgart, Germany, along with his wife. The Army then assigned him as a cook, and he became one of 30 cooks who prepared 3,000 meals three times daily for three years. Mr. Taylor separated from the Army in 1978. He continues to serve his fellow veterans by operating a motorized wheelchairs store and donating many scooters to local veterans as well as parts and services at a discount. – David E. Jacobs, U.S. Marine Corps: Mr. Jacobs joined the U.S. Marine Corps in 1968, during the height of the Vietnam War. He received advanced training in communication and eventually worked with helicopters and other aircraft with supplies heading to various locations. He separated from active duty in January 1973. Mr. Jacobs volunteered more than 750 hours in the past five years providing shuttle transportation for veterans to and from their vehicle to the clinic at the Southeast Veterans Affairs Medical Clinic in East Mesa. – George “Mick” Hutnak, U.S. Navy: Mr. Hutnak joined the U.S. Navy in 1965. His initial assignment was working with deck division aboard the USS John Willis DE1027. He was reassigned to work on the Navy’s drone program known as Drone Anti-Submarine Helicopter. His last assignment was working on the Grumman A-6A Intruders with Attack Squadron 176. He separated from active duty in 1970. Mr. Hutnak volunteers with the American Legion, the VFW Men’s Auxiliary and numerous veteran events and activities. He also volunteers as a member of the Apache Junction Veterans Day Parade Committee. – Jennifer Palmtag Tallion, U.S. Air Force: Ms. Tallion joined the U.S. Air Force in 1983. Her advanced training was in finance. While in the service, her department directly supported the combat troops when the U.S. invaded Grenada on Oct. 25, 1983. The department processed and distributed temporary-duty pay to the troops who were deployed. She separated from active duty in 1987. Ms. Tallion volunteers with numerous veteran activities and events. – Tim Farthing, U.S. Coast Guard: Mr. Farthing joined the U.S. Coast Guard in 1974. He received training as a fireman onboard an 82-foot-long patrol boat. His mission was to patrol U.S. coastal waterways to provide assistance to civilian and military ships and boats in distress, and he was directly involved in saving a lot of lives, according to the release. He separated from active duty in 1977. Mr. Farthing volunteers for the Commemorative Air Force at Falcon Field Airport in Mesa. He is also active with the American Legion Post 27 in Apache Junction, serving as a member of its executive board for two years. Participants in the parade include local veterans service clubs, motorcycle groups, car clubs, marching bands and equestrian associations. Entries are being accepted through Nov 7. Parade-entry forms may be picked at the Apache Junction Chamber of Commerce, 567 W. Apache Trail. For more information, e-mail AJVDParade@aol.com or call 480-393-6341.